The pressure was on. I’d invited a special friend to my home for lunch and wanted everything to be perfect. I tried to imagine what she might like for lunch. Looking for something light, I settled on my favorite Greek salad served with grilled chicken breast and crusty, rustic bread. It’s flavorful and special. I studied this recipe, imagined the flavors and remembered my visit to Lilie Belle Farms in southern Oregon, where I tried a divine candy, Lavender Fleur du Sel Caramels. The combination hit all the right taste notes – sweet, salty with a hint of floral. My memory moved on to Fran’s Chocolates. This Seattle chocolatier puts sea salt on caramels. My favorite variety is Fran’s Gray Salt Caramels. With my culinary memory working overtime, the cookies Pranee had given me at Christmas came to mind. She had added coconut to create her version of Russian Teacakes and called them “Coconut Teacakes.” That reminded me how much Pranee loves coconut. Coconut Caramel cookies won out and Martha Stewart’s recipe became my starting point. 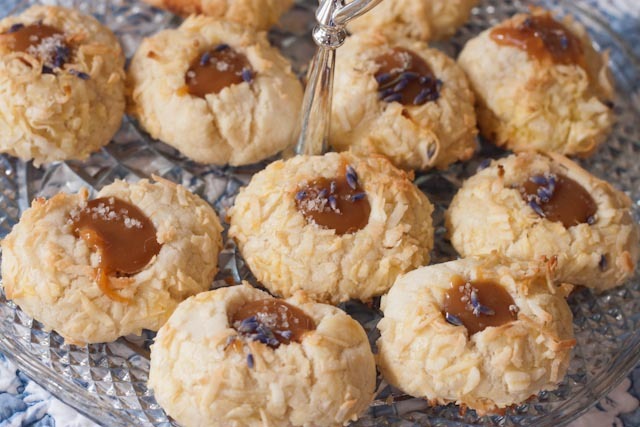 Lavender would give these cookies more flavor and personality. I added culinary lavender with the sugar plus lavender extract (from Lavender Wind Farm). After I finished baking the cookies and added the caramel, I sprinkled each cookie with a pinch of culinary lavender along with sea salt. For the culinary lavender, I selected Royal Velvet buds for its floral taste and vivid color. 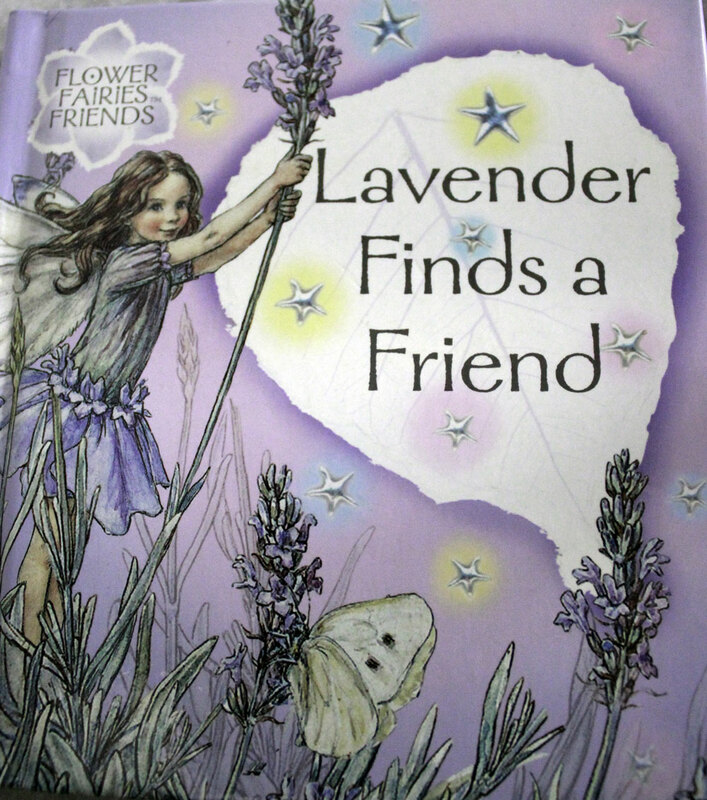 The culinary lavender came from Helvetia Lavender Farm in Oregon. The doorbell rang as I placed a plate of cookies on the dining room table. Everything was ready. Pranee walked into the dining room and glanced at the cookies. “Mmm, what are those? Is that coconut?” she asked. Eating with Pranee is fun because she appreciates good food and is curious about flavors. I told her how I’d found this recipe and modified it based on the chocolates I’d tasted. She told me that combining sea salt and caramel made the list of 2012 culinary trends. We chatted nonstop about cooking classes, websites and blogs. Pranee had brought Mango Tea from Maui. We sipped tea and praised the winning combination of caramel, coconut, lavender and sea salt. Cheers to cookies, tea and friendship! Preheat oven on 350º. Beat butter and lavender sugar with a mixer on medium speed until pale and fluffy. Then add vanilla and lavender extract. With mixer on low speed, gradually add flour and salt until combined. Press dough together in plastic wrap. Then roll into 1 ¼ inch balls, about 1 ounce each. Dip each ball in beaten egg, the roll in coconut. Place balls on parchment-lined baking sheets, and press an indentation into each with your thumb or with a wooden spoon handle. Bake for 10 minutes. Then remove baking sheets from oven, and repress indentations. Bake cookies until golden 8 to 10 minutes more. Let cool on wire racks. Repeat with remaining dough. Remove wrapping on caramels. Place the caramels along with heavy cream in a small saucepan over low heat. Cook, stirring constantly until the caramels are melted and mixture is smooth, about 4 to 6 minutes. Spoon into indentations in cookies, and sprinkle with sea salt and lavender buds. Store in an airtight container for up to 2 days. Note: You can also freeze these cookies for up to 1 month. 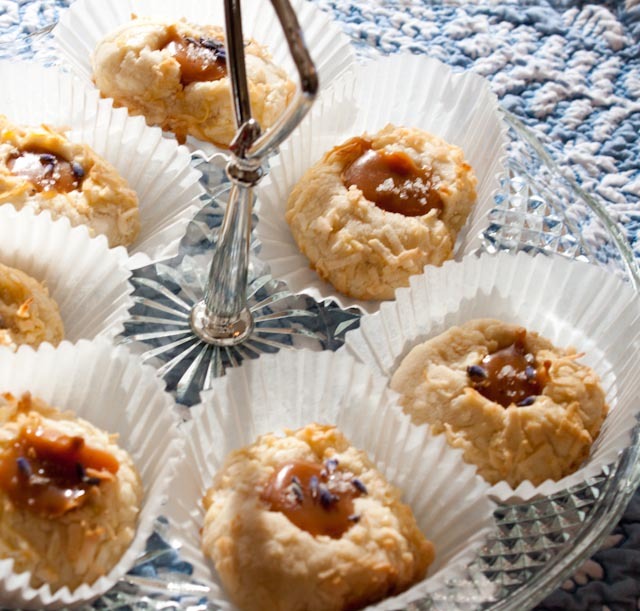 Variations: Instead of coconut, coat cookies with finely chopped walnuts, pecans or almonds. In place of caramel, fill thumbprints with raspberrry or mango jam.